Tim Hague Sr. was diagnosed with PD at age 46, and now he is a motivational speaker on the topic of this disease. This year, he published Perseverance, a memoir and self-help book based on his experience with PD. Chapter twelve of this book provides detailed examples of each of these skills. c) When you have Parkinson’s the exercise is not just an optional activity, it is a mandatory activity. d) To get the best benefits from your exercise, you need to push yourself to a 110%, even when you do not feel your best. e) Many studies have shown that the vigorous exercise is the best medicine to fight and manage Parkinson’s and it could also delay the progression of Parkinson’s. f) Set up a definite schedule for your exercises as part of your daily activities. I have scheduled my exercise activities first thing in the morning, before any other daily activities. This way I make sure I do them. I walk every morning, and I take Rock Steady Boxing classes three times per week. g) There are many good exercises you can try, and I provide more details about each of them right here in my blog. h) Find some type of a hobby to keep yourself occupied. Set aside a certain amount of time every day or week on your hobby. Select something that will challenge your mind, and something that you may find connections to the issues you are working on. i) I started publishing a blog about Parkinson’s and exercises that helps me and hopefully others in managing PD. j) Join a local Parkinson’s support group or one of the online support groups. I would recommend PatientsLikeMe.com. You can share your experiences, and find answers to your questions about Parkinson’s. k) Check out some of the articles in my blog, it has a lot of good information about managing Parkinson’s and keeping positive attitude. l) Never give up in fighting Parkinson’s; practice the seven skills of Perseverance that Tim describes, and you will be amazed what you can achieve. I would strongly recommend to everyone with Parkinson’s disease, and all caregivers to read this book. Tim writes, “Our best is good enough if we have the courage to see it through. Don’t ever give up on yourself. I guarantee you’ll be amazed at how far your best will take you.” Perseverance can be learned, just like any other skill. What’s the Best Exercise for Parkinson’s? Find the answers to this question on The Michael J Foundation posting. With it being a little over two years since I was diagnosed with PD, I’ve been reflecting on the experience of receiving the news and thinking about all the things that have helped me in managing the disease. What follows are just some thoughts and suggestions. Whether you were just diagnosed or know someone who was, maybe you’ll find some of this familiar — or maybe even helpful. Yes, it is very scary when you hear these words for the first time: You have Parkinson’s disease. – Will this end my life as I know it? – How did I get this disease? – Is this disease is incurable? – How will this impact my job? – How will this impact my family? – How can I manage this disease? 1) Find a good Neurologist if you don’t already have one — one you can trust, and feel comfortable with. Get a second opinion if necessary. 2) Go through all the possible tests to make sure you have PD. 3) Make a list of all your present symptoms and take them to your Neurologist. I noticed my handwriting getting smaller, soft speech, stooped posture, and a blank facial expression at first, but others experience tremors in your fingers or hand, loss of smell, your arms don’t swing when you walk, trouble sleeping, may not blink your eyes as often, constipation, among others. Some of these symptoms can be blamed on normal aging. If you experience any of these symptoms, it is best to talk to your doctor ASAP. 4) If you are diagnosed, your disease will be categorized according to a five point scale: Note: This stage description was obtained from the Parkinson’s News Today Publication. Stage 1; Mild symptoms such as tremors along one side of the body may be presented at this stage. Often the symptoms are mild enough not to interfere with daily life, but slight changes in walking, posture, or facial expressions may be noticed by those around them. Stage 2; Both sides of the body may be affected by slightly worsened tremors or rigidity. Issues with posture and walking may become quite noticeable and everyday activities may be harder to achieve but patients will still be able to do things for themselves. Stage 3; As motor symptoms become worse, patients may begin to experience loss of balance leading to falls and movement can become very slow. Although many patients can still live independently they may have difficulty in everyday activities such as eating or dressing. Stage 4; In this later stage, symptoms are now extremely limiting. Many patients can still stand without assistance but movement is greatly impaired. Most will need help with everyday activities and will not be able to look after themselves. Stage 5; This is the most advanced stage of the disease and most patients will experience difficulty in walking and standing, often requiring a wheelchair. Assistance will be needed in all areas of daily life as motor skills are seriously impaired. In addition, people with advanced Parkinson’s disease may also begin to suffer hallucinations. 5) Take all prescribed medications. Work with your doctor to find the best balance of medications. To get answers to some other questions listed above, go to references listed below, and talk to your doctor. Those first six items are no small task, but managing the disease is extremely important. Rock Steady Boxing; https://www.rocksteadyboxing.org/ . Read about my experiences with the Rock Steady Boxing in my referenced blog at the end of this article. Walking; https://movementdisorders.ufhealth.org/2015/12/17/walk-on-the-benefits-of-walking-for-people-living-with-parkinsons-disease/. Walking can be added to any of these other programs. Physical Therapy: Ask your doctor for prescription on the physical therapy (PT). PT’s can get you on the right type of exercise program for your specific type o problems you are experiencing. PT’s are very resourceful. 7) Whatever exercise program you select, make sure you do it on the regular basis. 8) Remember, you have to fight PD every day, and you can stay ahead of it, but you can’t give up. Medical Disclaimer: The content provided in this blog is for information purposes only. Any actions taken based on what is read in this blog are the sole responsibility of the reader. Under no circumstances should any of this information be considered medical advice. Before contemplating any actions by the reader should first be discussed with a qualified medical professional. Please provide me your feedback. I am glad we are having Parkinson’s disease Awareness Month. Today, worldwide it is estimated there are seven to ten million of us with PD. I am doing well in managing my PD. Hopefully with Rock Steady Boxing three times a week and walking six days a week the progress of my PD has slowed. It has been two years since I was diagnosed with PD, and my doctor says I am doing well, and she has not increased my medications. So, that is a good sign. The Parkinson’s Foundation of Western Pennsylvania were recognizing Parkinson’s awareness month by giving away free tulips and PD awareness cards during lunch hour in Market Square here in Pittsburgh. 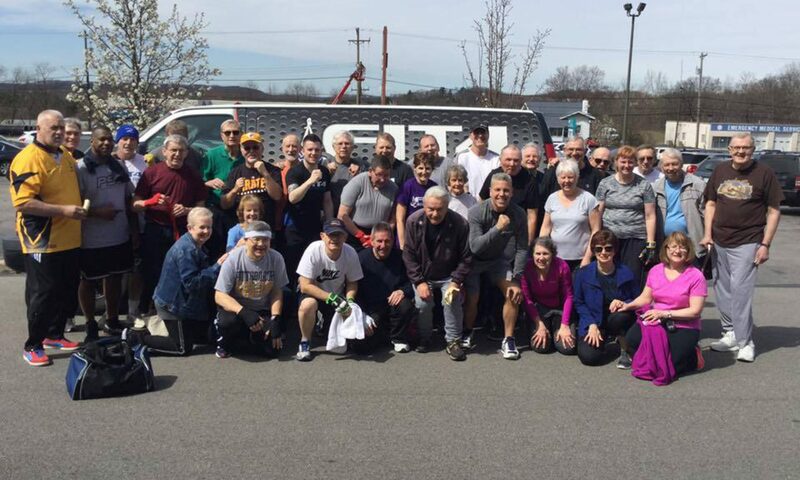 Rock Steady Boxing Clubs are holding special events in recognition of Parkinson’s awareness month. The Michael J Fox Foundation has scheduled special events throughout many cities to recognize Parkinson’s awareness month and to raise donations for Parkinson’s research. Click here to read about the latest breakthroughs in PD research. We can all help by making donations to our favorite charities. Another easy way to contribute is by using Amazon Smile and selecting your favorite Parkinson’s related organization. Find out more about Amazon Smile here. Fight Parkinson’s with Exercise Really Works. The Michael J Fox Foundation reports that forced exercise studies on Parkinson’s disease (PD) have shown improved mobility and quality of life, and possibly slower rate of disease progression. People with Parkinson’s disease (PD) benefit from many types of exercise — boxing, cycling, yoga and others. Regular physical activity can ease motor and non-motor symptoms, boost mood and improve quality of life. It’s good for general health and well-being and, in some cases, just as important as the medications your doctor prescribes to manage PD. Rock Steady Boxing Association and other research on exercise studies confirm similar benefits experienced by Parkinson’s patients. Check out the detailed reports on these findings on the articles published on this blog and the referenced links. Medical Disclaimer: The content provided in this blog is for information purposes only. Any actions taken based on what is read in this blog are the sole responsibility of the reader. Under no circumstances should any of this information be considered as medical advice. Before contemplating any actions by the reader should first be discussed with a qualified medical professional. 23andMe and The Michael J Fox Foundation have joined forces for the “Fox Insight Genetic Sub-Study powered by 23andMe,” using DNA data from PD patients. The researchers are analyzing DNA data from Parkinson’s patients that could have a possible influence in the development of Parkinson’s disease. 23andMe has the world’s largest genetic study of Parkinson’s disease (PD), now more than 11,000 participants strong. Previously I did my DNA analysis with 23andMe, and was so impressed by this initiative that I registered to participate in this Fox Insight study. If you are Parkinson’s patient you can help in this Fox Insight research study by registering at: https://foxinsight.michaeljfox.org/. If you do enroll and have not previously provided DNA sample, you will have an option to access 23andMe Health + Ancestry Service at no cost, and receive a complementary genetic counseling on PD associated genes included in that report. Please share this article with anyone you know with Parkinson’s. There is a good list on Parkinson’s News Today reviewing some facts about Parkinson’s — some of which are surprising. For example, the youngest recorded case of Parkinson’s was a child only twelve years old.